Here is it, a hunk of glass, that says the Foodbank of Santa Barbara County’s Healthy School Pantry program is the most innovative Children’s nutrition program in the nation. 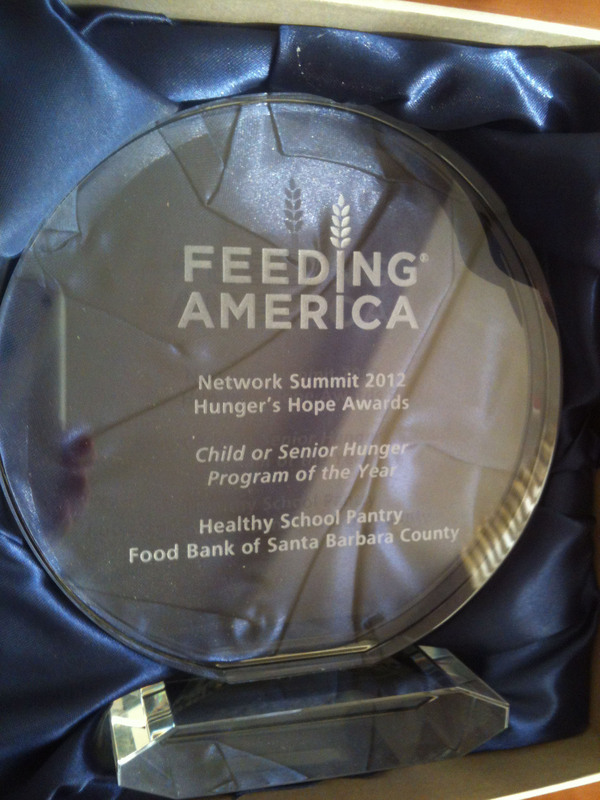 The award was presented at the 2012 Hunger’s Hope Awards at the Feeding America Unity 2012 summit. This is the second year in a row that our Food Bank has been acknowledged for being a network leader in programing. Last year we won for our Kid’s Farmers Market program, which is already being replicated at other food banks. 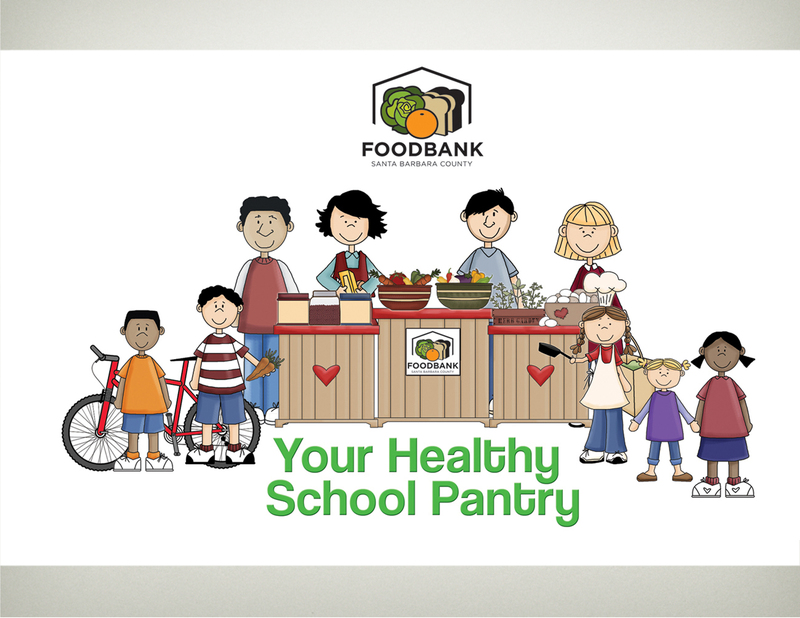 But the real winners are the communities that build up around the healthy school pantry. Communities not linked by the embarrassment or awkwardness that can come with accepting emergency food, but a community of families coming together in a fun and empowering way to receive some food, learn how to use it and to support each other in living healthy lives with the small amounts of money they sometimes have available for nutrition. 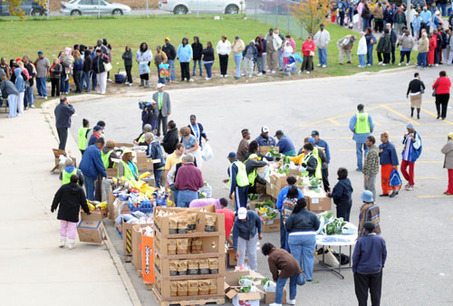 Do emergency food providers give food to those who don’t need it? Would you stand in a line like this unless you were desperate to put food on the table? It is our belief that standing in the hot sun/freezing rain (choose your geographical location) to get some food that will fill your belly for a short while, but leave your life unchanged is not an effective way for us to operate. 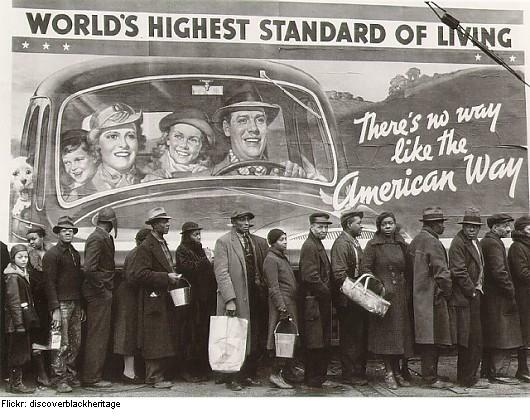 What has really changed since the great depression (except now people don’t dress as snappily as they used to). A school site is a place with an existing set of relationships, and is therefore a place where we can build on those relationships to effect a more lasting change in people’s lives. Our approach is set up what is in effect a health fair, which is open to everyone at the school. This takes place at the end of after-school activities, so that we get the parents and kids together at a rare time when they are together. 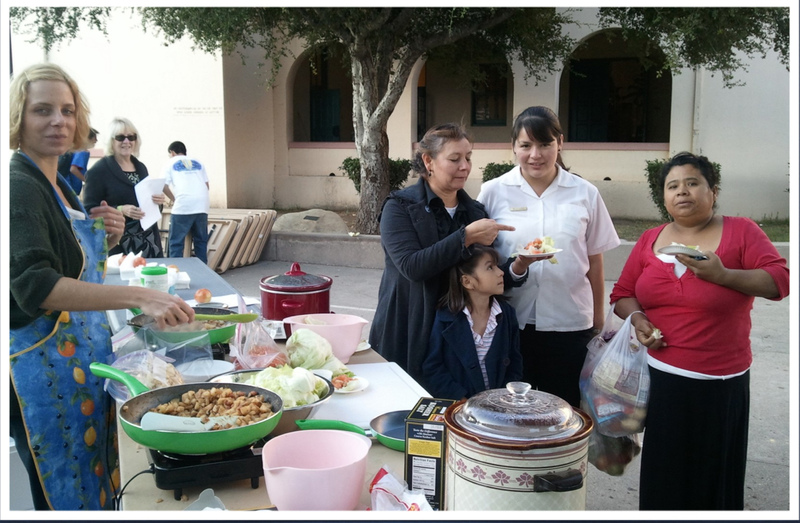 The difference between our ‘health fair’ and the typical school health fair is that people actually attend our one. That is because we have food available. Food has always been the draw, but unless you are leveraging the food by providing empowerment and education, then you are not getting the best return on the investment of this scarce resource. As people enter our pantry site (which can be inside or out) they immediately get to taste the recipe of the day. If they like it (and they usually do, because it is delicious and culturally appropriate) then there is a Foodbank Cooking Corps volunteer cook there to demonstrate how it is made – and how easy and quick it really is. 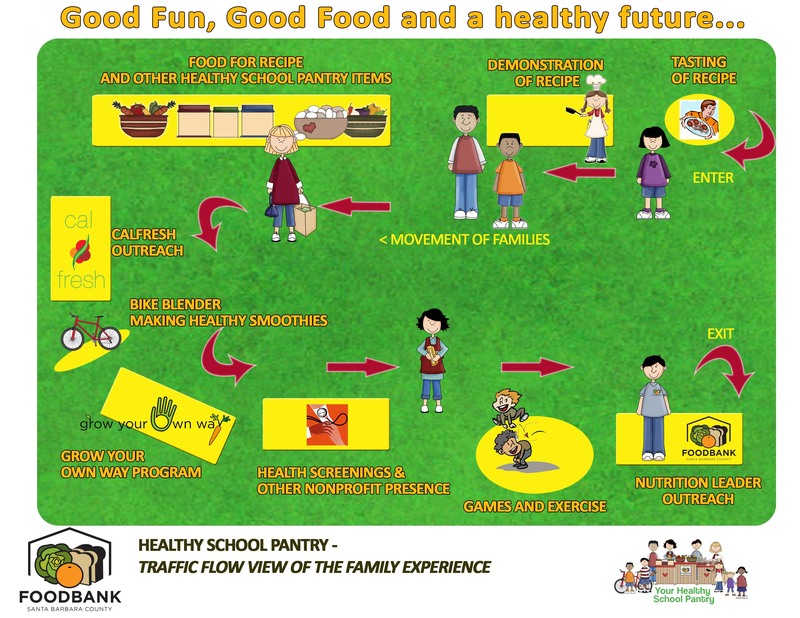 People then pick up a ‘Passport to Good Nutrition’, which if they get a number of stamps at education and activity stalls around the Healthy School Pantry, enables them to take home the exact food they need to cook the recipe they have just learned how to make, as well as a bi-lingual recipe card. We also provide them with some additional healthy food from the food bank. It tastes good, I can learn how to cook it, and I can get the actual food I need to make it at home?? How revolutionary is that. Other activities include SNAP outreach, our Grow Your Own Way program staffed by volunteer gardeners giving the materials and knowledge for people to grow some of their own food. There are also traditional health screenings through partnerships with local healthcare providers (we had 150 dental screenings for kids at a recent single HSP site) and physical activities and games and the Mighty Zumba, not to mention our famous bike blenders which allow kids to pedal healthy smoothies into existence.The HSP program has already served more than 1,000 new Santa Barbara County families countywide. The HSP sites currently operate at 7 sites countywide, serving families from 10 underserved schools.We are also facilitating Nutrition Advocacy Committees comprised of the parents attending the pantries, so they can critique the program, bring forward ideas and questions and hopefully forge an ongoing partnership with their Foodbank to achieve a common goal: a healthy, empowered community.Food can be health, energy and power, and that power can help people begin to move forward in all aspects of their lives.That’s the real victory. This wonderful, we had a new member applicant from a charter school apply for membership at our Foodbank recently. However, we were not able to move the application through the process because of a roadblock with the funding issue at this school. The school had a 501c3, but was being funded by local/state government dollars (Ohio Department of Education). The charter school was educating students within families that meet the guidelines for poverty level percentages and the principal was so excited with the possibility to assist these families and help the students concentrate on learning instead of what they won’t have to eat at home. I was so disappointed that we were not able to make it work. Would you please provide how you established this school pantry with the requirements related to funding/501c3 questions. I would be grateful to hear how you made it happen! Thank you. HSP is not a reimbursement program – more’s the pity – so there is no burden of proof on your part to a larger body like the USDA. When we pick schools for HSP we look at numbers of free and reduced as our guide and are focusing on 90 percent plus. I think it is also important to spell out that the HSP takes place in the after-school arena – so it may be possible for you to avoid any issues by tying it to a specific after school program, rather than getting into all the red tape about the school or the funding. At the end of the day, because the food bank is putting up the cost of the program, then it is up to us to make our best community survey of where the areas of most need and potential are and to act on it. That’s why they pay us the big bucks…oh that’s right, they don’t. Damn. Good luck. You can always speak to our program manager Gina gfischer@foodbanksbc.org for more info. Hi Erik! How often do you have HSP in the schools? Weekly? Monthly?